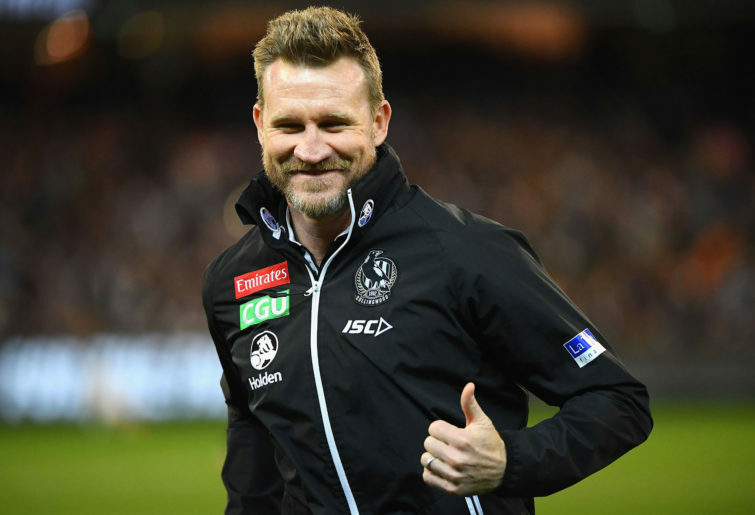 Having been lucky to secure another a contract extension after a fourth-consecutive season in which the Magpies missed the finals, Nathan Buckley and his Collingwood outfit were feeling the pressure after a 0-2 start to their 2018 campaign. However, a three-game winning streak, which included big victories over the Crows in Adelaide and Essendon on Anzac Day, had the Pies back on track. Sitting in 11th position after a Round 8 loss to Geelong, the Magpies put together their best form since the 2012 season, stringing together seven wins in a row, including a 42-point win over premiership contender Melbourne on the Queen’s Birthday. Despite jumping to second on the ladder following their hot streak, Collingwood were still in danger of missing the finals, especially after they dropped three games in the space of four weeks. The Pies regrouped, however, and won their final three matches to claim a top-four finish, marking their long-awaited return to September action despite losing many of their key players to injury throughout the season. In a tough qualifying final match-up with West Coast in Perth, the Magpies were extremely gallant, leading close to time-on in the final quarter. With the last three goals of the contest, the Eagles consigned Collingwood to a semi-final showdown with the GWS Giants at the MCG. In a scrappy but entertaining contest, the Magpies got over the line by ten points, setting up a monster preliminary final meeting with fierce rivals Richmond. Having failed to beat the ladder-leading Tigers on two occasions during the home-and-away season, Collingwood were rank outsiders going into the match. A stunning first-half blitz from Nathan Buckley’s men saw the Magpies lead by 44 points at half time and, despite some nervous moments late in the game, Collingwood advanced to their first grand final since 2011. Set to take on West Coast for the second time in the space of three weeks, the Magpies held the home ground advantage this time around. It looked a fait accompli that Collingwood would take home their 16th premiership after a five-goal-to-nothing start. In a gripping encounter, the Eagles slowly but surely fought their way back into the contest, taking the lead late in the third quarter. In an up-and-down final term, the Pies saw an 11-point final quarter lead eroded, with West Coast booting the final two goals of the game to clinch a remarkable premiership. Collingwood went home without any silverware, but they did leave the MCG with the respect of almost everyone within the AFL community, having risen from 13th on the ladder in 2017 to just one goal off a flag. 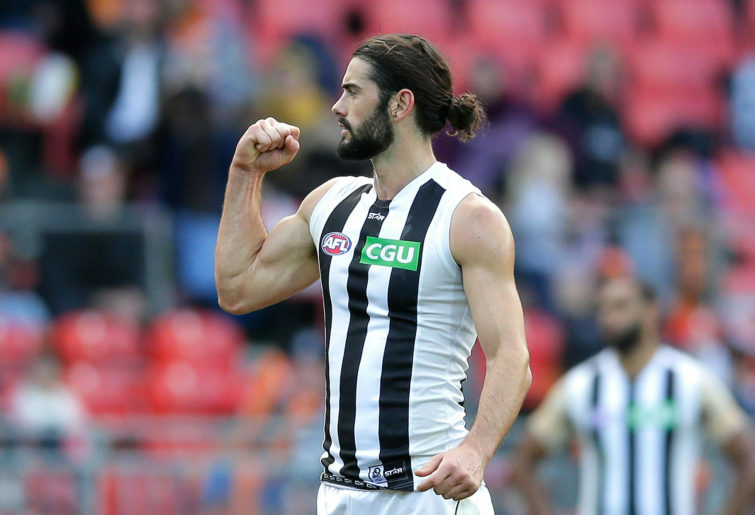 For the first time since 1994, the Copeland Trophy was shared between two players, with Brodie Grundy and Steele Sidebottom both rewarded for their outstanding years. Captain Scott Pendlebury finished in third place after another consistent campaign. 2010 premiership player Jarryd Blair was unfortunately delisted at the end of Collingwood’s season, with Kayle Kirby, Josh Smith, Adam Oxley and Sam McClarty all joining him. Tim Broomhead and Sam Murray were also axed but were eventually redrafted onto the rookie list. The Magpies were quiet for the most part during the player swap period, losing Alex Fasolo to Carlton via free agency, which saw Collingwood receive a third-round draft pick as compensation. They boosted their ruck stocks with the acquisition of Western Bulldogs premiership big man Jordan Roughead, with Collingwood giving up pick 75. With rumours circling about Brisbane star Dayne Beams wanting a return back to the Magpies, Collingwood moved heaven and earth to secure the former premiership Pie. After much speculation, a deal was struck that saw the former Lions’ skipper head back to Victoria, with the club also gaining picks 41 and 44 in exchange for selections 18, 56 and their future first round pick. With clubs now able to swap draft picks even after the trade deadline, Collingwood moved up the order, securing selection 51 by sending Geelong their picks 59 and 60. With the highly-rated Isaac Quaynor a member of Collingwood’s next generation academy, the Pies answered a bid on the 18-year-old at pick 13. Will Kelly, son of 1990 premiership Magpie Craig, joined the club as a father-son recruit after a bid from the Adelaide Crows, before another member of Collingwood’s academy, Fijian-born Atu Bosenavulagi, was picked up at selection 77. After a strong year up forward, rookie Josh Thomas was upgraded to the senior list, with Broomhead and Murray added as rookies. Murray is expecting a long-term ban after traces of cocaine were found in a drug test completed by the former Swan on match day. Irish duo Anton Tohill and Mark Keane also became Magpies after being selected as category B rookies. Matt Scharenberg was not considered for the best 22 due to a knee injury suffered in July last year. Having betrayed the club early in 2017 following a bar fight in St Kilda, Jordan de Goey found himself in hot water again last off-season when he was caught drink-driving at a random breath test in Port Melbourne. The 22-year-old was suspended from playing AFL indefinitely, hit with a $10,000 fine and forced to train with Collingwood’s VFL squad. Upon his return to the senior side in Round 4, De Goey showed that he had finally turned a corner, enjoying a break-out season as Collingwood’s most damaging forward. The former top-five draft selection booted 48 majors for the season to take out the Magpies’ leading goalkicker award, all the more impressive when you consider he played 21 of a possible 26 matches. De Goey was also pivotal to Collingwood’s flag tilt, booting 12 goals in September, including three in the grand final against West Coast. The leader of a multifaceted attack, the Magpies’ premiership hopes largely rest on the shoulders of this young man. The fact Collingwood not only returned to finals action but came within a goal of clinching a premiership is all the more impressive when you consider the number of injuries Nathan Buckley and his team of coaches had to factor in throughout the season. Much of the talk going into Collingwood’s campaign surrounded the fortunes of young tall Darcy Moore, who spent the summer training as a defender after starting his career in attack. What followed was a frustrating year punctuated by repeated hamstring injuries, with Moore managing just seven games for the season. Another player looking to put his frustrations behind him is Jamie Elliott, who has played just 17 out of the last 70 games. Elliott didn’t feature at all in 2018 due to persistent hamstring and ankle complaints, managing just four VFL appearances for the year. The 26-year-old went on a trip to Germany along with Moore to see a world-renowned hamstring specialist in November, and Collingwood will be desperately hoping that it allows both of them to be regular contributors. Dubbed ‘The Unicorn’ because he was rarely sighted in his first two seasons on Collingwood’s list, Brayden Sier made up for lost time in a big way last year. Originally drafted at pick 32 in the 2015 national draft, Sier broke through for a debut in Round 15, playing every game bar one on Collingwood’s march to a grand final. The youngster was a consistent performer in Collingwood’s finals campaign, averaging 21.5 disposals and 5.3 clearances in September, highlighting his ability to stand up in big games. The Magpies have an incredibly strong midfield, and Sier looks set to be a key component of it in 2019 and beyond. It hasn’t been all roses and butterflies for Daniel Wells since crossing over to the Magpies from North Melbourne at the end of the 2016 season, with the veteran managing just 14 games in his first two seasons in the black and white stripes. Achilles soreness and a foot injury saw Wells manage just four matches mid-season, with one more year remaining on his contract. At the age of 34, the 257-gamer is almost certainly entering the final season of a glittering career, and perhaps there is a fairytale waiting to happen. It’s a similar situation for Ben Reid, who could muster just six senior appearances in 2018 due to ongoing calf complaints. The 29-year-old returned to full fitness for Collingwood’s premiership bid but could not break into the team. The 2010 premiership player, like Moore, would be a handy inclusion to the backline if he can consistently prove that he’s fit enough, but with just 47 games from the past five seasons, it might be too much of an ask. 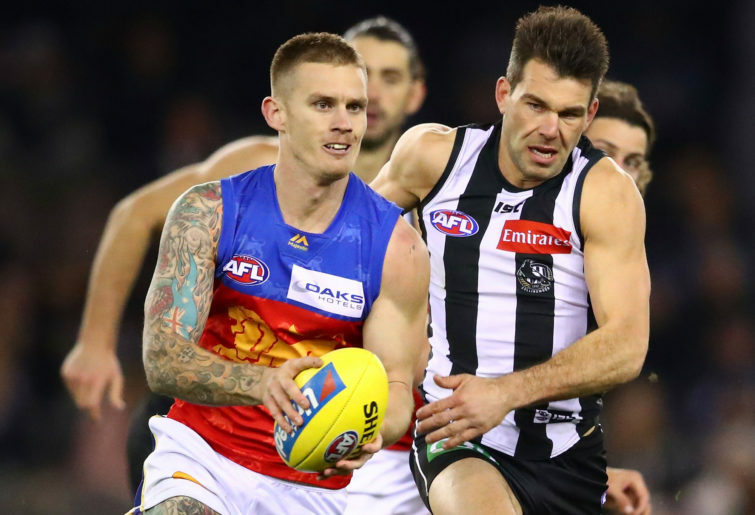 One of the biggest shocks of the off-season came when rumours started to circulate about former Brisbane skipper Dayne Beams moving back to Collingwood, the club he began his career with. Beams, who shifted to the Lions at the end of 2014 to be closer to his ill father, was still contracted to Brisbane for a further two years, and confirmed in a public statement at the end of Brisbane’s campaign that he would see out his commitment. He even announced his love for both the club and the Brisbane Lions’ playing group at the best and fairest night. Still, the talk would not go away. It would take until the final hour of the trade period for the rumours to come true, with Beams sent to Collingwood on a four-year deal in a blockbuster swap. A genuine star of the competition, Beams will add even more depth to what was already considered the best midfield group in the AFL. It wasn’t the only trade the Magpies were involved in on the final day before the deadline, with Jordan Roughead added to Collingwood’s list on a two-year contract after 138 games and a premiership with the Western Bulldogs. Versatile and capable of popping up at either end of the ground to take contested marks, Roughead will provide valuable ruck depth behind Brodie Grundy. As part of Collingwood’s Next Generation Academy, Isaac Quaynor was always destined to pull on the famous black and white stripes. An under-18 All Australian defender, Quaynor possesses terrific pace and energy in the same mould as 2016 Norm Smith Medallist Jason Johannisen. However, Quaynor isn’t just a rebounding half-back flanker, with the 18-year-old also highly capable of playing a lockdown role on either small or medium forwards. 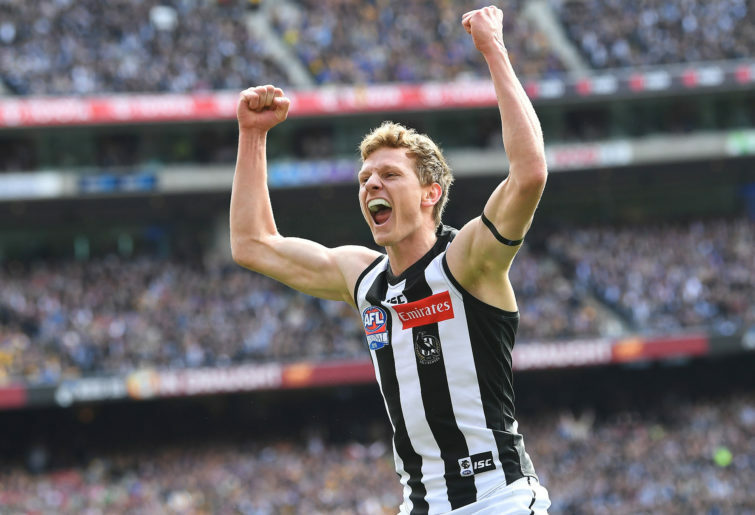 The Magpies will be hoping Quaynor can have a similar impact in his debut year to that of their last first-round draft pick, Jaidyn Stephenson. 2018 was definitely a ruckman’s year, with both Brodie Grundy and Max Gawn enjoying unbelievable campaigns. For Grundy, he asserted himself as Collingwood’s most important player, averaging 20.2 possessions, 3.5 marks, 5.2 tackles, 5.2 clearances and just under 40 hitouts per game. These stats saw Grundy post insane Supercoach numbers week in, week out, with his average of 130.5 points ranked number one across the league. Remarkably, Grundy’s lowest score during his campaign was 95 points, highlighting his amazing consistency. While he has the biggest price tag of any player, you can be sure that you’re investing your money wisely by picking Grundy in your opening ruck slot. Having ended the 2018 season in second position, Collingwood have received a far tougher draw from the AFL. The Magpies will face West Coast in a grand final rematch on two occasions, while they also face tough double encounters with fellow top four sides Melbourne and Richmond. Playing Essendon and the Western Bulldogs twice will also be a significant challenge, but on a positive note, the Pies will play just five times interstate. Two of those games will be in Sydney, while they head to Brisbane, Perth and Adelaide once each. Commercially, Collingwood have been rewarded for their outstanding season last year, receiving the lion’s share of marquee matches. As per usual, the Magpies will take on Essendon and Melbourne in blockbuster Anzac Day and Queen’s Birthday blockbusters respectively, with Collingwood to host the latter. In addition to those games, the Magpies feature on Thursday nights three times and Friday nights on seven occasions. Not one current Collingwood player was born the last time the Magpies took on Geelong in the opening round of a season, which is set to happen for the first time since 1982 this year. A few weeks later, Collingwood and the Brisbane Lions will return to the Easter Thursday setting for the first time in 15 years, while their Round 7 match with Port Adelaide at Marvel Stadium will be Collingwood’s first Friday night home game against the Power since 2005. As aforementioned, Collingwood will take part in two of the biggest home-and-away clashes of the year, with Anzac Day against an Essendon outfit striving for a return to finals action set to deliver a monster crowd. The Magpies will have an extra day of preparation over the Bombers, which could prove telling late in the game. The Queen’s Birthday match with Melbourne has taken on extra off-field significance since Neale Daniher was diagnosed with motor neurone disease. On the field, the rivalry is really heating up, with both sides finishing inside the top four last season. Last year’s crowd of 83,518 was the highest in the history of the two clubs playing on the June holiday, and there’s every chance that could be bettered again. It takes a lot to intimidate a strong, proud club like Collingwood, but the Magpies will well and truly be on the outer when they travel to Optus Stadium to play West Coast. A crowd in excess of 50,000 will be all too happy to remind the Collingwood players who won the premiership last season, while the Pies will also be trying to break a four-game losing streak against the Eagles in Perth. Having taken a leaf out of Richmond’s book, Collingwood were a much better side to watch in 2018, with their fleet-footed forwards extremely exciting to watch at the feet of an unconventional one-two attack featuring a 211cm American and a bloke who isn’t too far removed from playing for Port Melbourne in the VFL. Brodie Grundy is arguably the best ruckman in the competition, while their midfield, with the addition of Dayne Beams, is scarily good. The return of Lynden Dunn, Darcy Moore and, fingers and toes crossed, Ben Reid, will bolster the backline significantly. It’s honestly hard to pinpoint a weakness on the Collingwood list, and if they have better luck with injury I can see them going one step better in 2019.